I'm trying to identify the origin of these items,possibly put a date to them, Or at least know what the markings mean. 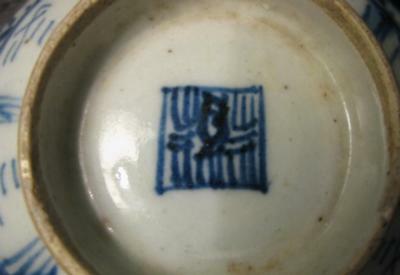 (the markings on the bowl and plate are similar but have different centers. Out of the three "salts" I sent the picture of the best mark, And that one is even hard to make out. Maybe the pattern of it holds some information? I have searched around all week and i am more confused then when i started, any help would be much appreciated. 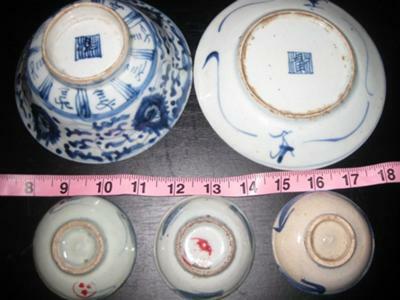 The top two items have Qing dynasty Jiaqing reign marks (see Ming-Qing Emperors), and are common items of the period. 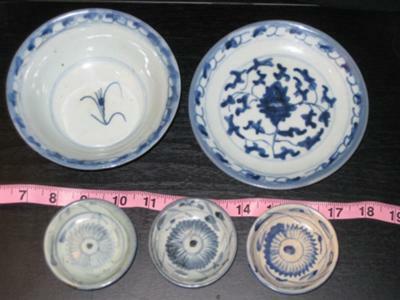 The smaller dishes are probably of about the same period, that is first half of the 19th century. 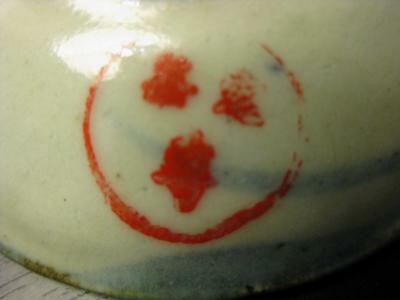 The red markings seem to be a sort of inspection stamp related to the production or export rather than item marks.